Dark wood with organic styling. Use as a lamp, a diffuser or both. Eliminate stinky smells the natural way. 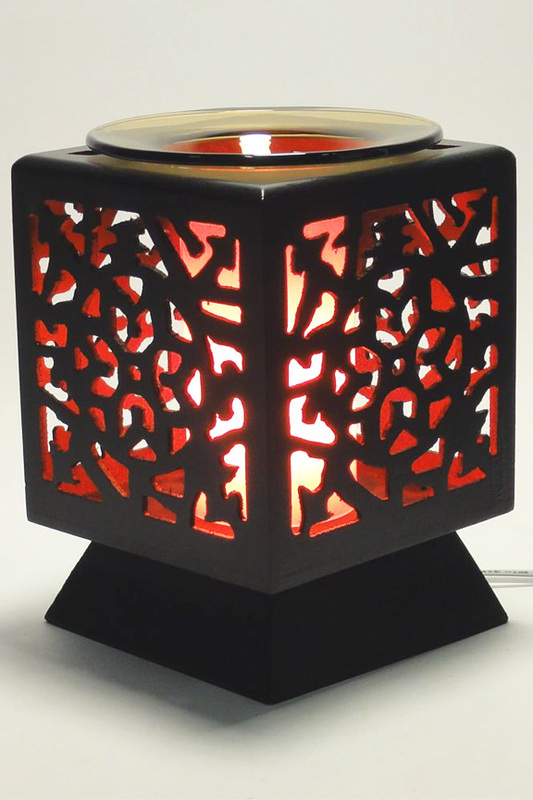 Deal with stinky smells in a safe way by using this attractive lamp instead of chemical sprays or open flames. A wooden frame houses a colorful glass lamp at the middle, and with a dimmer switch on the cord, you can make the illumination as subtle or vibrant as you like. An organic pattern is cut into the sides, and with a large flower at the center, it's reminiscent of a garden or forest. Use it as a decorative light alone, or add scented oils or wax to the glass dish at the top to spread your favorite fragrance throughout the room. Once you switch it on, the heat from the bulb will warm the dish to diffuse the scent, and by setting the dial, you can select the fragrance intensity that you prefer. Enjoy a fresh smelling home without risking health, wasting money, or harming the environment. This lamp will deliver just as much deodorizing power, but it also looks nice, and it features safe and clean operation. Plug into any standard outlet to complete the set up process, and get started right away because the bulb required is included and installed when it arrives. 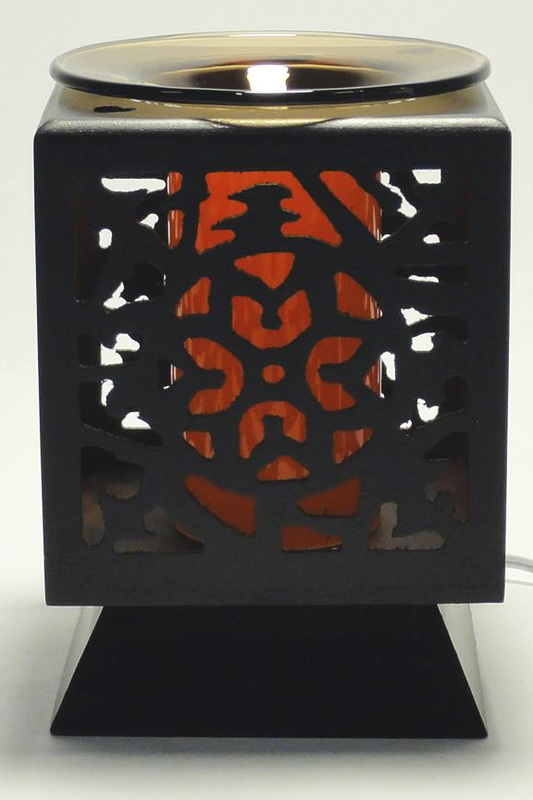 An intricate pattern of organic shapes is cut into each side of this lamp, and with negative space that looks like twisted branches, flowering plants, and lush shrubbery, it has an attractive overall look. The wood is darkly colored and coated with a smooth finish, and behind it is a thick glass cylinder that has a warm tone to it. The glass not only colors the light when you turn the unit on, it also concentrates the heat that is generated, and directs it upward to the dish above. 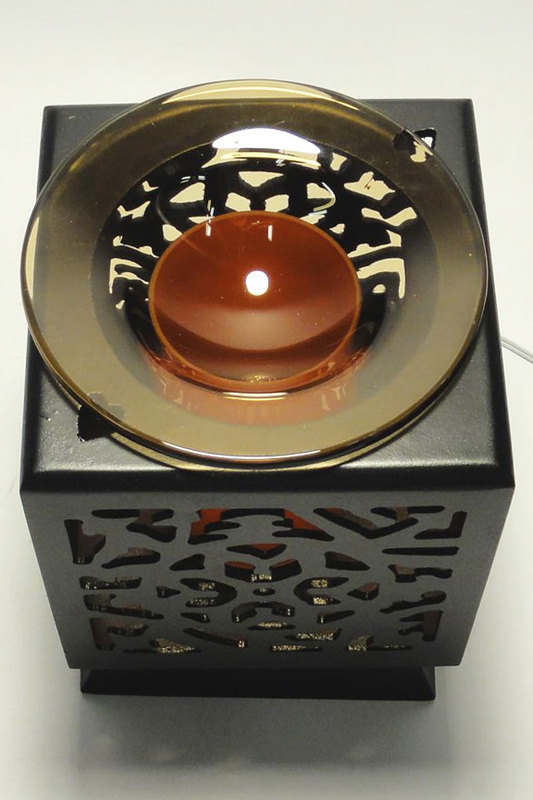 A reddish-orange glow will shine brightly from behind the ornate wood exterior, and as the bulb heats up, any scented oil or wax that you place in the dish will warm and diffuse its fragrance into the air. Use the dimmer dial to set it from high to low, and ensure the ideal amount of light and fragrance. Electric Operation - Never worry about flames that flicker, or heat that's uneven. Electric power makes this warmer easy to operate, but it also ensures even heating that is exactly the temperature that you prefer. Plug into any standard outlet and use the switch to power it on. Safe and Natural - Stop using wet sprays filled with toxic chemicals to deodorize your home, and never worry about sticky residues or questionable ingredients coating your floors and furniture. This clean and flame-free alternative offers a safe and effective alternative. Top Quality - Intense detailing creates an organic design that's reminiscent of a garden, and it's complete with a flower at the center. The solid wood frame is treated with a dark, smooth finish, and at the center of the lamp, a thick glass cylinder colors the light, and intensifies the heat. When you look deeper, you'll notice high quality electronics that ensure easy operation and long lasting performance. Totally Adjustable - Use the dimmer switch on the cord to power it on or off, but also use it to dial in the exact light and heat intensity you want. The wide range allows you to dim the bulb to almost no glow, or turn it all the way up to a bright and vibrant light. Because brightness and heat generation are related, this action also adjusts the intensity of the scent that 's diffused. Easy Operation - Turning it on and adjusting the temp is easy to do, and the minimal maintenance that's required is quick and simple to accomplish. The long lasting bulb is totally accessible, so you can change it in seconds, and the dish that holds the oil is totally removable, so just hand wash or place in the dishwasher once it gets dirty. Two-In One - It's nice to look at, and useful as a lamp alone, especially when you factor in the ability to dim the bulb. As a fragrance diffuser it is also highly effective, so when you combine both functions together, you have a very useful and beneficial device. Environmentally Friendly - With almost no waste, and way less pollution when compared to candles and incense, this offers a clean and natural way to spread your favorite fragrance into the air. Dimensions 5.75" x 5.75" x 6.75"
Dish Size 4" Diameter. 1" Deep. 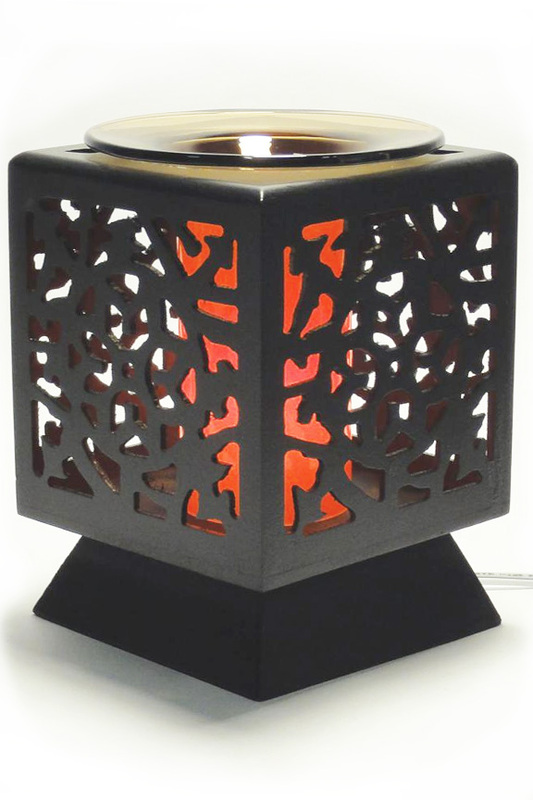 Uses Use as a decorative, dimmable light, a fragrance diffuser, or both. When the light is on, you can utilize the generated heat to warm wax and oils in the dish above. Compatibility Use with liquid oils or solid wax. Controllable Yes. Use the dimmer switch to turn it on or off, and set it to the light and fragrance intensity you prefer. An organic design features a flower at the center, and with a warm glow behind it, creates an attractive focal point for any location. Add your favorite oil to enjoy the smell as it diffuses into the air. Order Yours Today! Spread your favorite fragrance and add decorative colored light to any room. Deodorize your home the natural way. A compact, decorative lamp that doubles as a fragrance diffuser. Deodorize your home wiithout harsh chemicals.